Are you in need of grocery assistance? 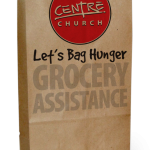 One of the ways we exercise our community muscles here at Centre Church is through our grocery assistance program called Bag Hunger. The Bag Hunger program is a unique opportunity to show God’s love in a practical way by providing food and toiletries for people who need them. You can pick up a grocery list of items to purchase at the Welcome Kiosk before or after our evening service or you can download the list now by clicking here. The groceries can be dropped off at the Bag Hunger Bin before or after the evening service or you can contact Bethany Horner during the week to coordinate a drop off spot. At the end of each month, we deliver bags to the homes of people throughout our community. Pick up a list of items to purchase from the Welcome Kiosk Sunday evenings or you can download the list by clicking here and just head straight to the store. Return the groceries with these non-perishable food items to the Bag Hunger Bin at Centre Church. Groceries will be gathered at the food pantry and delivered by the volunteers to the homes of recipients. The date and time will be determined between the volunteer(s) and recipient. If you are interested in volunteering to distribute food, or would like more information, please contact Bethany Horner at 814-571-9097.